Aperture fever has struck! 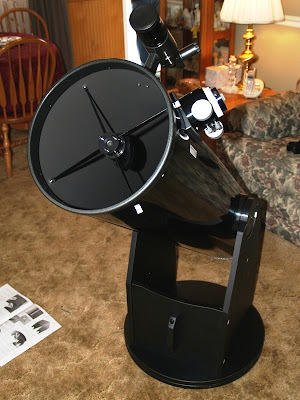 I am the proud new owner of a Zhumell 10" f/4.9 Dobsonian. Gotta love astronomy Christmas presents! My 4.5" Tasco will now be my quick grab 'n' go scope. The boxes it arrived in were not surprisingly huge. If I remember correctly the whole setup weighs about 68 pounds. 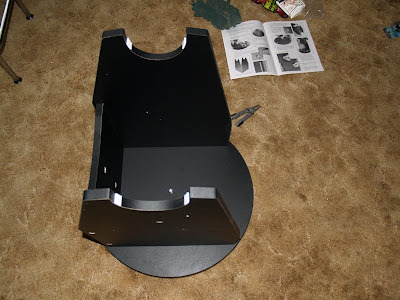 It shows up in a few separate pieces to aid in shipping, so some assembly is required. The first pieces to come out of the box are the parts of the base. 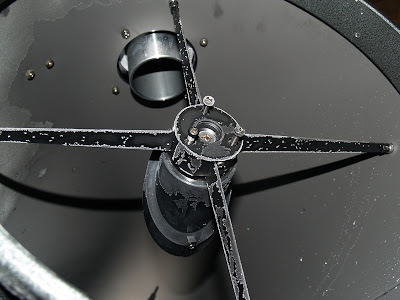 The newer model Zhumells ship with the smoother roller bearing setup, so azimuth movement is very smooth. The azimuth axis is pretty much assembled from the factory, so all that's left to do for the base is to put the sides and front brace on. When installing the sides and front brace, self-tapping cap screws are used to secure all the pieces together, and to attach the handle to the front brace. I'm not yet sure what this handle is for, as its too low to use to pan the telescope. Its gotta be for something. And here it is all put together. This thing is simply massive when assembled. But don't let the size fool you. It is actually quite easy to maneuver around when observing, thanks to the roller bearings. 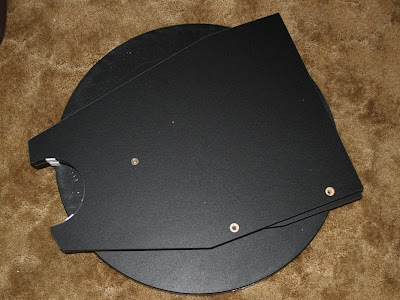 The nice thing is, when pointed at zenith, it only takes up a 22" circle on the floor, so finding a place to put it when not observing won't be too bad. The accessories that this kit comes with are actually very nice. Much nicer than I expected, to be honest. With how cheap one can get this kit, I figured that the accessories would be merely a selling point. 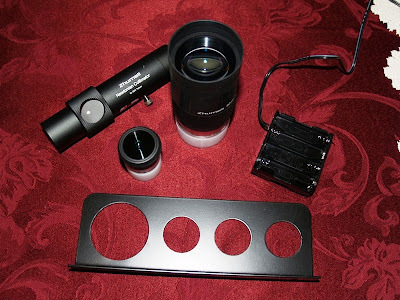 Here you can see the eyepiece rack, the laser collimator, the battery pack for the mirror cooling fan, and the two eyepieces it comes with. The 1.25" 9mm is your typical Plossl. While it is of nice build quality, it really isn't anything extraordinary. The 2" 32mm Wide-Field eyepiece, however, is quite the performer! Look at the size of the eye lens on that thing! Which brings me to first light... Strangely enough, the "new scope curse" didn't strike and I got clear skies on the night I assembled it. So I took it out, turned on the cooling fan and let it cool down. First thing I did was collimate it. With a fast focal ratio of f/4.9, collimation is key to good views. It took me a few tries to get it down at first, but eventually I got the hang of it, and collimated it a few times to be sure. After I was sure of the collimation, I sighted in the included 8x50 RACI finderscope. The Right Angle Correct Image finderscope flips the image over, so it is as if you were actually looking at the stars, i.e. up is up and down is down. Being as this is my first Dobsonian, I'm not quite familiar with the alt-az mount yet. So I stuck with familiar wide-field targets. I first swung the telescope to M42. The nebula was visible in the finderscope, and was right in the FOV of the 32mm immediately. This eyepiece is simply astounding. M42 was plain as day, even in the full moon light. Nebulosity was just plain obvious, a big step up from my 4.5" reflector. The amount of detail in the nebula just blew my mind. In my 4.5" reflector, I could see the nebula, but now I can truly appreciate it. Next was the Pleiades, M45. Before, I could only see a bit of it at a time, because the widest eyepiece I had was my 12.5mm. Now, with the 2" 32mm Wide-Field, I can see almost the whole open cluster. The Pleiades take on a whole new look with large aperture, with thousands of pinpoint stars, all blue and crystalline. I couldn't make out the Merope nebula, as the moonlight was too strong. My primary concern with this telescope was coma. I was initially afraid of coma, especially with how everyone uses it on the forums. After seeing M45 in the 32mm eyepiece, I think coma, while visible, will not be a problem. In fact, the views are so amazing, you won't even notice any coma at all. If you're looking at buying this telescope and you're worried about coma, stop worrying and order it! You will not be disappointed! I also hit Mars, as it was near zenith. For the first time, I was able to see Mars as a disc, and not just a smudge. Detail was obvious, and the use of a Wratten 23A filter helped a little. Although I do prefer the unfiltered, natural color of Mars better. It showed as a large disc, with faint reddish-orange color, and darker brown detail at 208x magnification. Seeing prevented further magnification. I was able to get in a few minutes of Saturn before a cloud moved in front of it. What I was able to observe was breathtaking. It really is more beautiful in big aperture. Eventually, I got iced out, and had to go inside after an amazing night of observing. Everything was coated in frost. A few things still need addressed, however. The first thing is the altitude bearings. I'm surprised Zhumell hasn't addressed this yet. Apparently they didn't put lock washers on the bolts that hold the bearings to the optical tube assembly, so they come loose after a night of observing. This is easily fixed and will be covered in a near future article here. The other thing is the altitude bearing tension springs. The are difficult to attach in the field, and I feel they provide too much tension. These mods and many more will be covered here in the future. All in all, this is a great scope package, at an even better price. I would recommend it to anyone, whether they be a beginner or an expert. That it was unquestionably specific enlightening. I actually visiting leading-edge around akin increased within your mission posting, plus execute you actually abiding we is going to take note of a person's posting having said that I'll search your backside second. At this moment please click here Cash Advance With thanks to get awesome posting. This is usually a brilliant webpage plus I actually could not highly recommend you actually males more than enough. I actually love a person's posting. It is handy for your people today over the internet. Currently follow-up Cash Advance Thanks a lot to get awesome posting.